helmet « Big Squid RC – RC Car and Truck News, Reviews, Videos, and More! You are browsing the "helmet" tag archive. 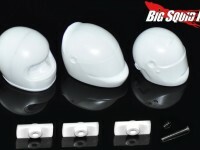 The crew over at Serpent have announced a new helmet set for your 10th scale Formula 1 body. The helmets allow you to personalize your body and the ability to change looks. The set comes with 3 different helmets and have a part number of #170328, hit up This Link for more information. Click Here for more Serpent news on BigSquidRC.